The OSU Veterinary Teaching Hospital repaired a fractured femur on a bobcat brought in by Chintimini Wildlife Center. One of the most beautiful cats in Oregon is rarely seen by humans. Although bobcats have stable populations throughout the state, their nocturnal lifestyle, excellent camouflage, and wariness of humans keeps them hidden from view by all but the most avid back-country hikers. This week, doctors and staff in the OSU Veterinary Teaching Hospital (VTH) were thrilled to have the opportunity to work with a bobcat up close and personal. 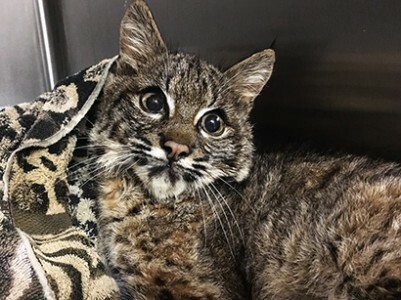 A few days earlier, a good citizen found an injured juvenile bobcat in the ditch off highway 20 near Blodgett, and risked their skin to wrap the ferocious, snarling cat in a blanket and take her to Chintimini Wildlife Center. The center immediately provided water and food for the starving cat then sedated her enough to give her an examination. They found a broken leg and called OSU for help. 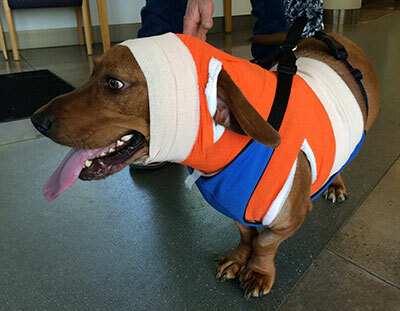 Several veterinarians in the Corvallis area provide pro-bono assistance to Chintimini, but the most challenging medical cases often go to OSU. (See previous story). “The leg was fractured with a number of pieces and fissures,” says orthopedic surgeon, Dr. Jennifer Warnock. Dr. Warnock was able to rebuild the leg with plates and screws donated by DePuy Synthes. She designed the placement of the hardware specifically to avoid the formation of soft tissue calluses in the upper leg muscle. “Calluses can cause quadriceps adhesions which would slow the cat down,” she says. That was a critical issue for an animal whose survival depends on speed in hunting. There are other concerns when operating on wildlife. For one, the anesthesia is different than it would be for a dog or house cat. “Our anesthesia team is amazing,” says Dr. Warnock. “They are so skilled with all species, and great at pain control.” In fact, many hands worked together to save the bobcat, from the skilled technicians who assisted in surgery, to the experts in radiology, to the fourth-year veterinary students who provide post-surgery, tender, loving care. The surgery bill was funded, in part, from Dr. Warnock’s teaching fund, and, in part, by the college’s Olive Britt Hope Fund. “This is a great example of the quality of OSU care and compassion; how we can come together to make it right for this beautiful cat,” says Dr. Warnock. The surgery went well and the bobcat is now recovering in its kennel at Chintimini. “Her IV is out and she is eating like a champ,” says a spokesperson for the refuge. Dr. Tiffany Kimbrell, student Margot Mercer, and Dr. Jennifer Warnock were part of the surgery team that repaired a fractured femur in a bobcat from Chintimini Wildlife Center. Posted in OSU Veterinary Teaching Hospital, Uncategorized. There are many challenges for the management at the Oregon State Penitentiary (OSP). One of the less critical, but very messy, is a problem with the Canadian geese who like to gather in the prison yard. Until 2011, huge flocks of them made a stinky mess that caused sanitation issues. Then Felix came to the rescue. Felix is a heeler mix who knows all about rescue. He was saved from a shelter by Project POOCH. The nonprofit organization places rescue dogs in youth correctional facilities, where inmates learn responsibility, and gain emotional support, by caring for dogs. They also train the dogs in basic obedience skills and prepare them for adoption. Felix was the first dog from Project POOCH to be adopted by OSP. He was ‘hired’ to keep the geese out of the prison yard, a job he does well and enjoys. Last year, Felix made a different kind of visit to a different kind of infirmary. He was referred to the OSU Veterinary Teaching Hospital by his veterinarian, who suspected he was lame due to a torn ligament in his knee – also known as a Cranial Cruciate Ligament (CCL) rupture. 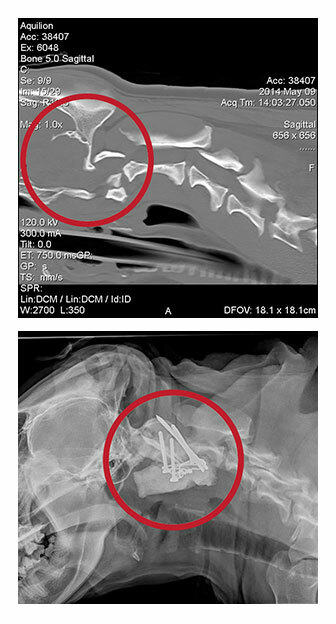 A relatively common problem in active dogs, these ruptures can be successfully treated with a surgery called a Tibial Plateau Leveling Osteotomy (TPLO). If you look at a standing dog from the side, you can see that it’s leg is always bent and the knee is slightly flexed. This bend means the CCL inside the knee joint is always load-bearing, and the constant tension makes the ligament susceptible to injury. With a torn CCL, every time a dog stands or put weight on the leg, the femur rubs on the back of the tibia. This rubbing causes pain and inflammation, and is why most dogs with a torn CCL are lame. The philosophy behind TPLO surgery is to completely change the dynamics of the dog’s knee, so that the torn ligament becomes irrelevant. During surgery, the tibia is cut and rotated so the tibial plateau, where the femur and the tibia meet, can no longer slide backwards. This stabilizes the knee joint and eliminates the need for the CCL entirely. TPLO is a delicate and complex surgery that should always be performed by an experienced veterinary surgeon. The OSU Veterinary Teaching Hospital has two board-certified, veterinary orthopedic surgeons who perform many TPLO surgeries every year. Felix surgery was very successful and, within a few weeks, he began taking leash walks, but he is not yet ready to resume his geese-chasing duties. His surgeon, Dr. Jennifer Warnock, also suggested he lose ten pounds to minimize the stress on his other knee joint, and to help prevent arthritis. Recently, one of Felix’s handlers sent a ‘thank you’ note to the OSU Veterinary Teaching Hospital, along with a list of quotes from fellow inmates that was published in a Project POOCH newsletter. The quotes expressed how important Felix is as a friend and valued member of their community. A 3D echocardiograph shows the blood moving through Lulu’s heart (bright colors). Lulu is a big bundle of soft, black fur who is full of happy energy despite having been born with a heart defect. The four month-old lab mix was recently transferred to the Humane Society for Southwest Washington (HSSW) from a shelter in Southern California. As part of the Animal Shelter Alliance, HSSW makes a temporary home in their shelter for several hundred out-of-state animals each year. The majority of those animals have health issues. Dr. Lauren Overman is the managing veterinarian at HSSW. With more than 5,500 animals entering their shelter each year, her team does a lot of spay and neuter surgeries, but they also diagnose and treat a wide variety of health issues. In a routine exam, prior to Lulu’s spay surgery, Dr. Overman discovered a loud heart murmur, so she referred Lulu to the OSU Veterinary Teaching Hospital for evaluation. The Lois Bates Acheson Veterinary Teaching Hospital at OSU is equipped with a state-of-the art, 3D echocardiograph that allows doctors to view the inside of a patient’s heart in real time, as it is beating and pumping blood. An echocardiogram of Lulu’s heart revealed a small hole between her aorta, the main artery in the body, and her main pulmonary artery. The hole is known as a left-to-right shunting patent ductus arteriosus (PDA) and is a normal vessel in a fetus, but should close within twenty-four hours of birth. That did not happen with Lulu. In a healthy heart, blood returning from the body is pumped from the right side of the heart to the lungs to pick up fresh oxygen and then returns to the left side of the heart. The left side of the heart pumps the oxygen-rich blood out the aorta to the body. In Lulu’s heart, the PDA allows blood to flow from the aorta into the pulmonary artery, creating a ‘short-circuit’ or shunt from the systemic to the pulmonary circulation. As a consequence, the lungs and the left side of the heart see an increased amount of blood. This often leads to congestive heart failure before a dog is one-year old. Dr. Courtney Smith is in her final year of a three-year cardiology residency at the hospital, and was assigned to Lulu’s case. She and the entire cardiology team, including Drs. Katherine Scollan, Nicole LeBlanc, and Julia Treseder, decided that Lulu was a good candidate for corrective surgery. The funding to cover Lulu’s surgery was provided in combination from the College of Veterinary Medicine’s Olive K. Britt Hope Fund and the HSSW’s Chopper fund. The HSSW Chopper Fund was created to help shelter animals with costly medical issues and is supplied through the generosity of the society’s donors. Amazingly, the surgery on Lulu’s heart was done without having to open her chest. First, a tiny incision was made on the inside of her right back leg, and a catheter was passed from the femoral artery into the aorta and across the PDA. This was done with the aid of a fluoroscope and echocardiography, which allowed Dr. Smith to view the interior of the heart on a screen as she operated. Once in place, the catheter was used to guide a specially designed wire mesh cylinder, called an Amplatz canine ductal occluder, into the open PDA. In a few seconds, blood began clotting within the occluder, and very quickly created a solid plug that stopped the blood flow through the PDA. Lulu came through the two-hour surgery with flying colors. 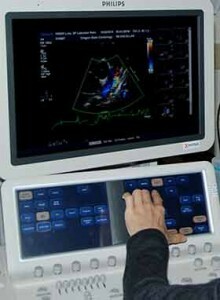 Chest x-rays and a recheck echocardiogram showed proper blood flow in her heart with no residual flow through the PDA. However, her caregivers will need to restrict her activity for one month while her device permanently adheres in place. Lulu went home the next day to her foster family. “They will have their hands full trying to keep her from not being such an active puppy, now that she feels better,” says Dr. Overman. Lulu’s prognosis is excellent. She will return to OSU in a month for a checkup, and then, if Dr. Smith gives the okay, she can return to normal puppy activity and be placed on the HSSW website where her darling face and sweet, loving personality will find her a forever home. 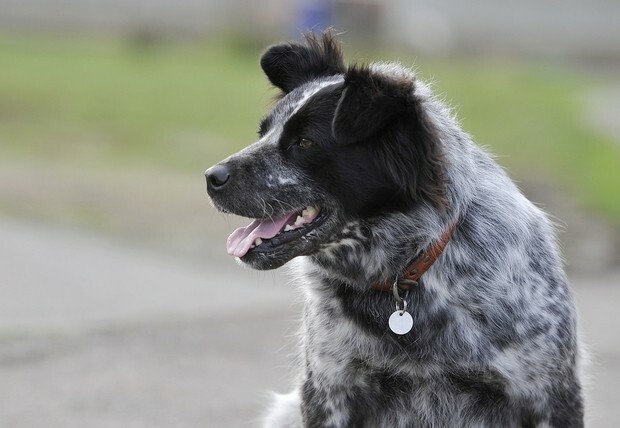 Last year, Cooper’s veterinarian became concerned when his gum did not heal after the removal of a bad tooth, so he sent a tissue sample to the OSU Veterinary Diagnostic Laboratory. The result was bad news: squamous cell carcinoma. LaBrocca was referred to the Oncology Service at the OSU Veterinary Teaching Hospital (VTH) where oncologist Dr. Shay Bracha confirmed that Cooper had a tumor in his jaw. Because the cancer was malignant, Dr. Bracha knew that Cooper’s best chance for survival would be to remove the tumor with a margin of 2 centimeters of surrounding tissue. Unfortunately, that would require partial removal of the jaw itself. After describing this option to Cooper’s mom, she sadly decided not to proceed. “I thought I was saying ‘Goodbye’,” says LaBrocca. Stan Stearns founded the Gabriel Institute after his beloved Saint Bernard, Gabriel, died while being treated for osteosarcoma. 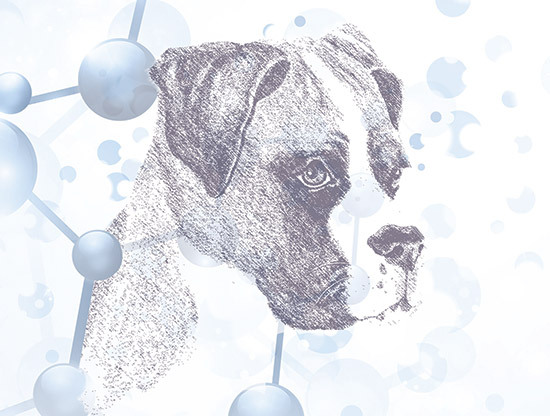 The goal of the Gabriel Institute is to save both dogs and humans through support of cancer research. Fortunately for Cooper, one month before his diagnosis, the Stearns Family Foundation donated a $500,000 Intraoperative Radiotherapy System to the VTH. It is the only system of its kind available at a veterinary hospital. Conventional radiation treatment for tumors occurs post-surgery, and is administered through the skin over a period of many weeks. The Intraoperative Radiotherapy System provides one precise dose of radiation to a tumor cavity during surgery. The dose is created by accelerating electrons through a tube, onto a gold target where low-energy x-rays are generated and emitted evenly in all directions. Then the surgeon closes the incision. The advantages of the system are fairly obvious: A much shorter treatment span of lower dose radiation to the area most likely to contain remaining cancer cells, while sparing healthy tissue from side effects. Cooper is now more than a year past his tumor removal with no sign of recurrence. A dozen other pets have received the same treatment and are doing well. Bracha will gather data from these treatments to demonstrate the efficacy of Intraoperative Radiotherapy. He is also helping OHSU adapt this treatment to their human cancer patients. Researchers in the College of Pharmacy at Oregon State University have developed a way to selectively insert a compound called naphthalocyanine into cancer cells. The compound is attached to an extremely tiny nanoparticle whose properties allow it to travel through the blood vessels leading to cancer cells, but not to healthy cells. Once there, the naphthalocyanine will glow when exposed to infrared light. 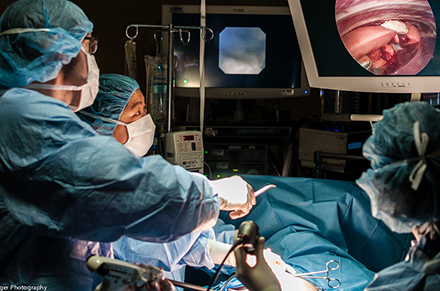 This allows surgeons to more accurately identify which tissue to remove and which to leave. Even more exciting is the component of this new treatment: Exposing the naphthalocyanine to a different level of light causes the compound to burst, killing the cancer cells. The treatment has been shown to be remarkably successful in laboratory mice with ovarian cancer, completely preventing cancer recurrence while showing no apparent side effects. Now the College of Pharmacy is partnering with the College of Veterinary Medicine to test it on dogs with malignant tumors. 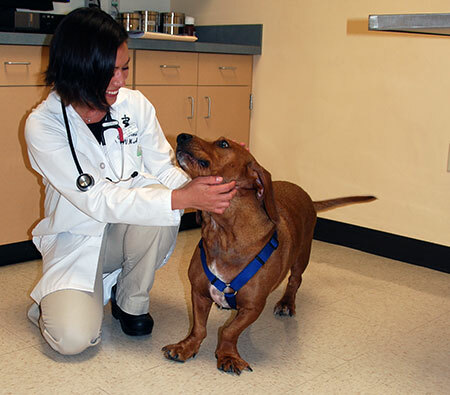 Rebecca Camden is a dog lover and long-time supporter of the College of Veterinary Medicine. She recently purchased a $60,000 Fluobeam Imaging System to be used in the testing of the new nanoparticle treatment. In addition to providing infrared light, the Fluobeam system provides real-time video and images of the process. The first clinical trials are scheduled to begin this summer. In another OSU collaboration, Bracha is working with Jan Medlock, a mathematical biology researcher in the College of Veterinary Medicine, and Vince Remcho, a researcher in the Department of Chemistry. They have founded an OSU spinoff company called Lasso Metrics that plans to produce a low-cost, early detection test for cancer. The test will use biomarkers – molecules in bodily fluids that are unique to specific kinds of cancer. The Bracha team recently identified the biomarkers for bladder cancer. They did this by looking at the blood from three groups of dogs: healthy dogs, dogs with urinary tract infections, and dogs with bladder cancer. When the blood was analyzed, they found 96 proteins specific to the bladder cancer patients. Now Remcho will use this information to develop a microchip that could be placed in a cell phone and used to detect cancer from a test strip with a drop of urine on it. Remcho calls it ‘lab-in-a-chip’. This screening tool could eventually be used by veterinarians and doctors in their offices, providing an early detection tool that is quicker and cheaper than a traditional biopsy. Posted in OSU College of Veterinary Medicine, OSU Veterinary Teaching Hospital. 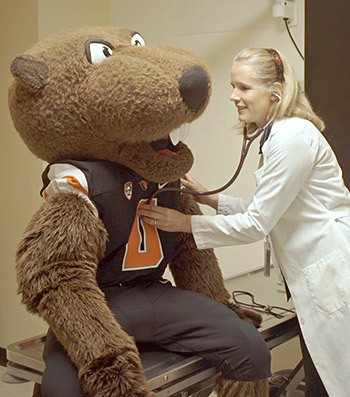 Oregon State University mascot, Benny the Beaver, visited the Lois Bates Acheson Veterinary Teaching Hospital to get a checkup in preparation for the upcoming football season. You can tag along with him in this video! Dr. Jennifer Warnock, an orthopedic surgeon at the Lois Bates Acheson Veterinary Teaching Hospital, releases at Merlin falcon after repairing its fractured wing. At the Rogers Wayside Park near Silverton, Oregon, Dr. Jennifer Warnock and OSU veterinary student Kyra Knutson placed a pet carrier in the middle of a grassy field. It was a quiet spot surrounded by trees and, more importantly, it was on the north-south bird migration path of the Pacific Flyway. Warnock donned a pair of heavy, foot-long, leather gloves, opened the carrier door, and gently removed a brown bird the size of a cockatoo. The bird was covered with a lightweight blanket to keep it warm and calm. As Knutson removed the blanket, Warnock lifted her arms and let go. The bird was so fast, it took off in a blur and landed in the nearest tree before they could even watch it fly. After a few minutes, the bird flew across the field to a taller tree. “She’s cutting just the way she is supposed to; that’s a good sign,” said Warnock. The bird was a Merlin, a type of small migratory falcon, also known as a Pigeon Hawk. Six months earlier, a good Samaritan had stopped and rescued the bird from the middle of a road north of Rogers Wayside and took it to the Turtle Ridge Wildlife Center near Salem. The Merlin had a fractured wing so they called the OSU Veterinary Teaching Hospital to ask if a surgeon was available to repair it. Unfortunately, the answer to that question is often, ‘No’. The small animal hospital at OSU is generally limited to the treatment of cats and dogs, but Warnock is an orthopedic surgeon with a personal interest in raptor rehabilitation, and squeezes enough money out of her teaching fund to help about one bird a year. 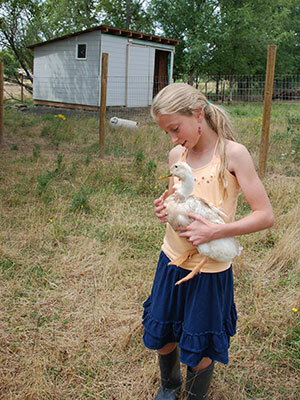 She uses that opportunity to give students with an interest in avian medicine an chance to observe the surgery. “It’s a great learning experience for them,” she says. Dr. Wendy Baltzer helps Henry move his weak leg on the underwater treadmill while student Giovanna Coto helps him stay upright. Michaels’ fondness for the two goats is obvious, and they are definitely pets rather than livestock, so when Michaels found Henry laying on his side, unable to rise or stand on his own, he took the goat to the local veterinary emergency room. There Henry was diagnosed with mild anemia and intestinal parasites, neither of which explained his lameness. Henry’s x-rays were normal so the veterinarian recommended Michaels take Henry to OSU Veterinary Teaching Hospital. When Henry arrived at OSU, large animal veterinarian Keith Poulsen ordered diagnostic tests, but it was a simple physical exam that gave him his first clue to Henry’s problem. Dr. Poulsen detected significant muscle atrophy in Henry’s legs. He suspected Henry was suffering from white muscle disease, so while he waited for the test results, he put Henry on vitamin supplements and a high protein diet. White muscle disease is a degenerative muscle condition caused by deficiency in either selenium or Vitamin E. Selenium is a trace mineral found in soil and it plays a critical role in reproduction, thyroid hormone metabolism and muscle cell health. Most livestock producers in the Pacific Northwest know that Oregon soil contains very low amounts of selenium, so animals whose primary nutrition comes from pasture and locally grown hay or alfalfa need selenium supplements. But people who own a couple of goats or horses as pets are often not aware of the problem. Before a pet owner considers adding selenium to an animal’s diet, they should check with their veterinarian. Most dog and cat food already contains selenium and too much selenium can be toxic. Once Henry’s diagnosis of white muscle disease was confirmed, Dr. Poulsen ordered selenium supplements and a program of rehabilitation for nerve dysfunction and muscle weakness. This included acupuncture, range of motion exercises, physical therapy and walking on the underwater treadmill. 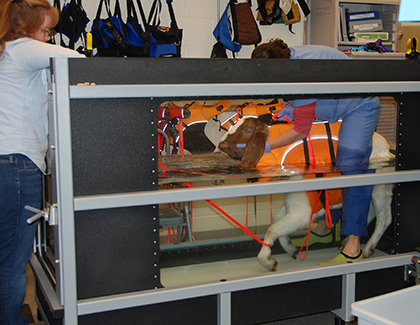 How hard is it to get a goat to walk on an underwater treadmill? Depends on the goat. Henry’s mellow personality made it a cake walk, so to speak. Fourth-year student Giovanna Coto was assigned to Henry’s care while he was in the hospital and quickly became attached to the affectionate, easy-going goat. “He’s a love,” she says. Every other day, for the first week Henry was in the hospital, Coto loaded him onto to a wheeled platform for his journey through the large animal stalls, down the hallway to the treadmill. He required no straps or sedation, but quietly lay still for the entire ride. Once there, Coto sat with him, stroking his back and talking to him while he waited his turn for the rehab room. At first, although supported by a sling, Henry had trouble moving his legs on the treadmill and required help. But within a week, he showed marked improvement in strength and coordination. By his eighth treadmill session, he was able to walk from his stall to the rehab room on his own, use the treadmill without help, and walk back to his stall. Watch video of Henry on the underwater treadmill.